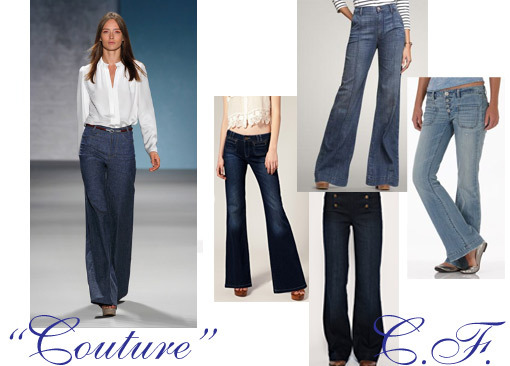 Flared and wide-leg jeans have been in and out of style for a few years now. 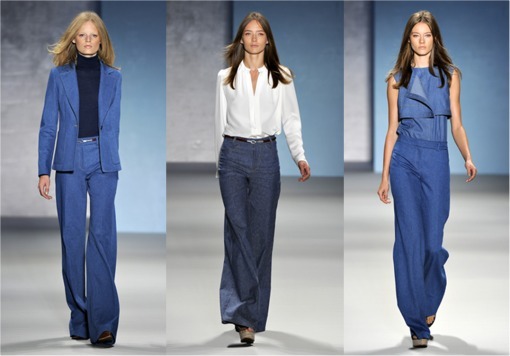 The current take on this trend, best shown through these pieces from the Derek Lam Spring 2011 RTW show, features ’70s-inspired, high-waisted denim that is fitted through the hip and loose on the bottom. This is a perfect cut for balancing out fuller hips and thighs, or for girls that just want to retire their skinny jeans for a while. If you’re not a fan of high-waisted pants, don’t worry! There are still many flared styles that feature a lower-cut waistline. Read on for some tips on how you can get this runway look yourself. The Derek Lam Spring 2011 collection showcased clean basics paired with bright indigo trousers, as well as numerous denim-on-denim looks. Celebrities like Kellie Pickler, Katie Holmes, and Penelope Cruz favor the wide-leg style because of its comfort and the effortlessly chic look it creates when paired with a crisp white shirt or plain tee. Their looks below perfectly echo those we saw in Derek Lam’s collection. 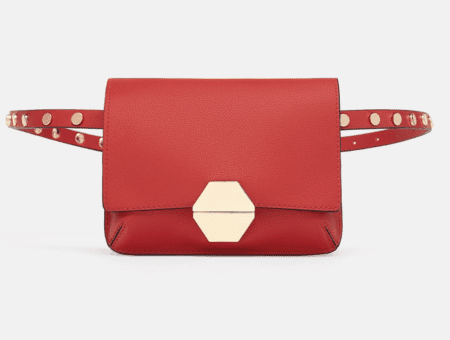 Get the Derek Lam Look for Less! You don’t have to spend thousands of dollars to get the same look seen on the runways and celebs! Below are a few options of affordable jeans so you can test-drive this trend on a college budget. Product Information: Indigo Stretch Denim Flare Leg Trouser- Derek Lam, Light-wash Flare Jean- American Eagle, High-waist Flare Jean- Gap, Medium-rinse Flare Jean- Asos, Wide-leg Jean- Asos. To keep from looking like you’ve stumbled out of That ’70s Show, pair your flared jeans with up-to-date accessories. Keep the look fresh by switching out platform shoes with cutout oxfords. A sheer button-down looks chic partially tucked in, while a scarf offers a pop of color. Product Information: Necklace- Forever 21, Shirt- Topshop, Headband- Forever 21, Tank- Forever 21, Scarf- Modcloth, Shoes- Forever 21, Jeans- Gap. 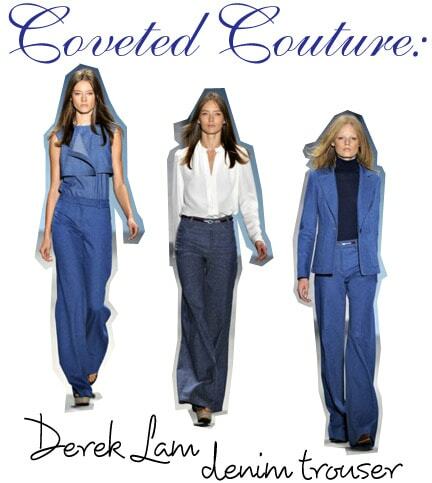 Are you a fan of Derek Lam’s high-rise jeans? Are you trading in your skinnies for wide-legged or flared denim this spring? 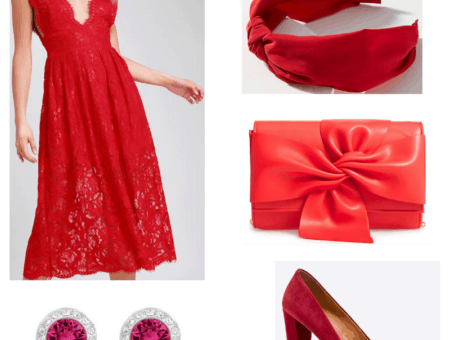 What other designer duds are you currently lusting after? Let me know in the comments! Next CF & Coca-Cola Giveaway: Win an iPod Touch!